Barista-quality espresso, long coffee and Cappuccino made easy. Generous 1.7 Litre water tank and 250 g bean container makes up to 10 coffees. Easy-to-use button controls and a rotary dial put full drink-making control at your fingertips. Three temperature settings and three grinding levels, plus adjustable coffee strength and water volume, for customised results. Manual steam nozzle for café-quality, frothy cappuccinos; easy to clean for maximum hygiene and convenience. Calling all budding baristas: theres a straightforward way to create professional espresso, long coffee and cappuccino drinks at home. 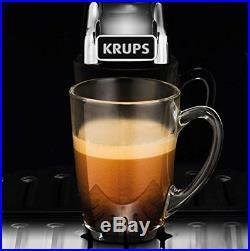 Introducing the KRUPS Arabica Manual EA811040 fully automatic espresso machine. Combining ease of use with advanced technology, the elegant and compact Arabica Manual brings a touch of style to the kitchen all without taking up valuable worktop space. Despite its small footprint, its still got an extra-large water tank and bean container, meaning more coffee and fewer refills. Button controls and a large rotary dial make it a breeze to use, while customisable settings let you make drinks just the way you like them. Dont forget the manual steam nozzle for café-quality cappuccino at home! 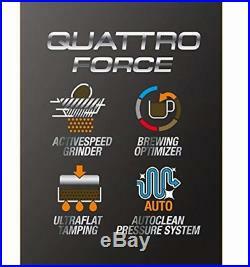 Meanwhile, KRUPS Quattro Force underpins every step of the process from bean to cup, delivering exceptional. A thing of beauty, the sleek Arabica Manual boasts a new elegant design with concealed screws and branded metal inserts for a sophisticated feel. Meanwhile, its compact size means it fits comfortably in even the smallest of kitchens. Showcase it on your worktop knowing it wont get in the way. Whilst compact, Arabica Manual still packs a punch in the coffee-making arena. Fitted with a generous 1.7L water tank and 250g bean container, it can make up to 10 coffees without needing a top-up. Hows that for a convenient coffee maker? With push buttons and a rotary dial, this machine is simple to use. Fill the water tank and bean container then press the power button to begin preheating. Then place a cup under the height-adjustable coffee outlets then press the standard espresso or strong espresso button for delicious espresso straight to your cup. It even makes two cups at once! 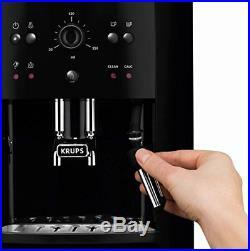 Just place a cup under each outlet and press your chosen espresso button twice in quick succession. You can adjust the temperature, grinding fineness and water volume for coffee just the way you like it. Just press the steam button to switch to temperature setting, then press the strong espresso button once, twice or three times to set your desired temperature. Youll find the grinding fineness knob inside the bean container the finer the grind, the stronger the coffee. Use the rotary knob in the centre of the control panel to select your volume (20ml to 220ml). Youll feel like a true barista using the manual steam nozzle to froth milk for your cappuccinos. Pour fresh milk into your cup, immerse the nozzle and push the steam button to start frothing, moving your cup in a circular motion for a delicate foam. Press the button once again to stop then place your cup under the coffee outlets to dispense your espresso. Its easy to clean too: just run steam cycle again to flush out any milk traces or remove it completely for an intense clean. 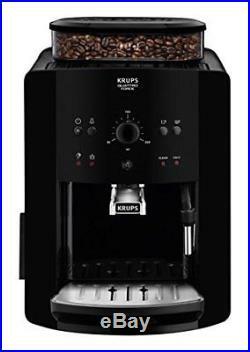 The item "Krups Arabica EA811040 Automatic Espresso Bean to Cup Coffee Machine" is in sale since Thursday, November 29, 2018. This item is in the category "Home, Furniture & DIY\Appliances\Coffee, Tea & Espresso Makers\Bean-to-Cup Coffee Machines". The seller is "northxsouthltd" and is located in ballymoney, Antrim. This item can be shipped worldwide.